Having released seven albums in the last thirteen years, Eldritch from Italy must have thought that their time for a live record had finally come. 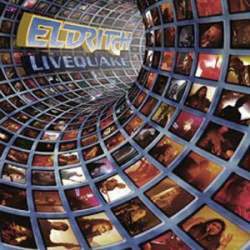 Founded in the early Nineties, Eldritch were at first heavily influenced by American prog metal gods WatchTower, which left its traces in their band name and in the sound of their early CDs. Later on, the Italians bade farewell to overly complex structures and embraced a more contemporary power metal sound. Livequake has become a surprisingly pleasant tour de force where the band offers songs from the last four albums on the first disc. Emphasis has been put on the recent Blackenday (2007) and Neighbourhell (2006), although a few tracks from Portrait Of The Abyss Within (2004) and Reverse (2001) can also be heard. The second CD starts with seven tracks from El Niño (1998) which had been rereleased a year ago with tons of bonus material. The first two albums Headquake (1997) and Seeds Of Rage (1995) are only present with two resp. one song. As a bonus, the package comes with a DVD that contains the whole concert plus some bonuses like a documentary, some interviews and three video clips. Does it make sense to separate the new material from the old one? Basically no, but Eldritch still show unrelentingly that their early stuff played with today’s means works still perfectly well. There are secret power prog hits to be found on both discs: The World Apart, This Everlasting Mind Disease, No Direction Home, From Dusk Till Dawn and certainly many more. The two hours of music prove one more time that Eldritch may not have the status of Dream Theater, but certainly have a better knack for sensible songwriting. The only criticism I can come up with are the English announcements between songs. Eldritch are an Italian band that played in front of an Italian audience in Pisa, but when you intend to release that show later on, you have to make some compromises, I guess. Eldritch fans will be exquisitely served with this three-disc package which is sold for the price of a normal CD. Those yet unfamiliar with the band will also get a great introduction to their music. I come rarely across better presented live recordings by metal bands.